Together with the 18-200mm this is an ideal cam for journeys. It is lightweighted, handsome and the image quality is on high Nikon-standard. I use it together with my D700 without any difference of quality within normal ISO up to 800. 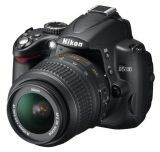 Awesome camera, I am selling my Rebel Xti and will be getting this. I do not like the colors, I am really disappointed, D80 was better and D40 was the best! More pixels but less quality, not good!! !